MD&A’s highly skilled technicians perform custom installations of packing rings and tip seals on-site using a unique mobile containerized machine shop. Our installation process ensures optimal clearances, maintaining design efficiency and reducing likelihood of vibration due to seal rubs. View the video on the advantages of our custom fitting of packing and seals. For additional information call MD&A’s On-site Seal Services today at (518) 399-3616 or use our Contact form. Turbine seals prevent steam from leaking between the rotating and stationary components. Having excessive clearance due to either component distortion or through seal wear reduces turbine efficiency. 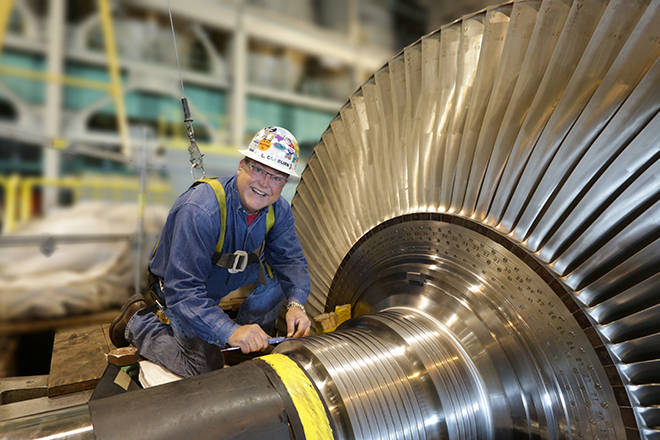 Having clearances that are too tight, will result in turbine rubs and operational problems. Installation of packing rings and seals by experienced turbine technicians is a key part to your outage. Skilled technicians can custom machine your replacement seals to best fit distorted components, and establishing proper seal clearances. Having the proper tooling and skills enables MD&A to perform this work efficiently and with great precision. Elliptical Bore Distortion- Turbine Diaphragms, Blade Rings, and glands cases frequently become elliptical from years of service. This changes seal radial clearances, resulting in seal rubs and subsequent wear and increased seal clearances. Decreased sealing efficiency, decreases turbine efficiency and output. Using the distorted component dimensions, our technicians and Engineers design and manufacture the replacement seals to better accommodate the distortion. Our Seal technicians provide the final adjustment to accommodate the uneven distortion within the component and frequently make radial adjustments to offset for minor component misalignment. Dishing Distortion of the Diaphragm- The axial relationship between seal teeth and the turbine rotor is critical to a smooth running and properly sealed turbine. As a turbine ages, the interstage diaphragms / nozzles may creep axially due to differential steam pressures. This axial displacement changes the relationship between the stationary seal teeth and the rotor. If the change becomes too great, the rotor will rub the seal teeth, causing vibration and increased seal clearances. With consideration of “As Found” axial clearances, MD&A can custom make and fit packing to restore seal axial clearances. MD&A not only provides precision design engineering of manufactured rings and seals, but sends expert technicians with 20 to 30 years of experience in the field for installations and repairs. Our crews arrive with a fully-equipped mobile containerized machine shop, complete with advanced CNC equipment, printer, computer, high-speed wireless access, and all necessary tools.